Her injury had been nasty. She’d been hit in the head with a golf ball, one struck, she believes, by someone who worked at Sony and felt terrible about the incident. “My first thought was ‘I’m gonna die,’” Martsella told Kotaku over e-mail, sharing a picture of herself after the incident, blood streaming down her face. She described the events that she said led up to the impressive Sony bundle. Marstella got over twenty stitches for her trouble. Two weeks ago, the Hawaii-based former high school golfer saw an ad for a Sony-sponsored professional golf tournament and decided to volunteer to be a caddy. “I thought it’d be a really cool experience to be in the action with professionals,” she told Kotaku over email. She had been hit right in the forehead. At first, she didn’t know how bad it was. “I didn’t realize my hands were on my forehead, when I took them down blood started pouring down my face,” she said. Marstella was whisked off to the hospital, where she got stitches and a CAT scan to check for internal bleeding. She said that the first few days after the accident were brutal. “I slept until 4pm, my entire face swelled up, and I had two black eyes,” she said. Marstella said that her scar has been healing “beautifully.” Though she said on Reddit that she signed a waiver before volunteering, she told Kotaku that the country club covered her hospital bill. 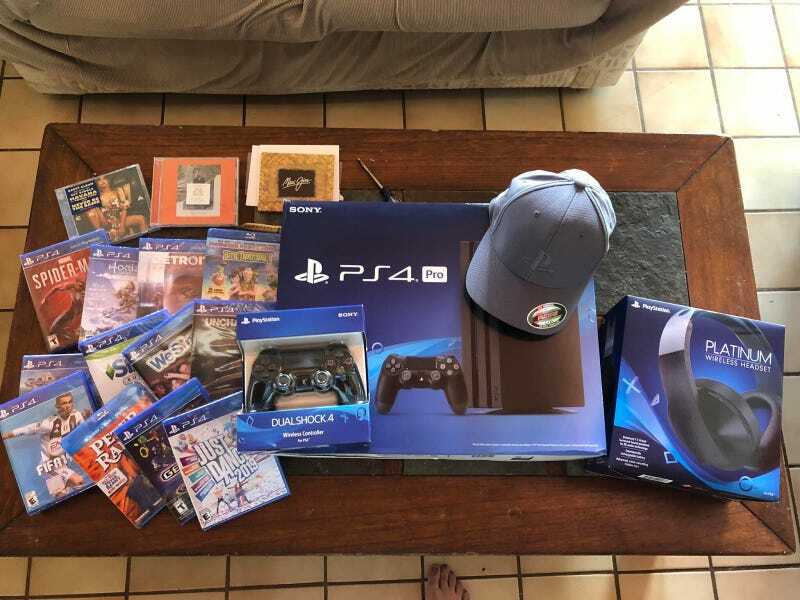 Last Wednesday, long after things seemed resolved, she got another souvenir from her adventure: a big game-filled care package from Sony’s San Mateo offices. This isn’t something she asked for or knew was coming. While she was in the hospital, the person in charge of the volunteers at the Sony Open got in contact with Marstella’s mother. Marstella said that the golfer whose ball hit her was a Sony employee and had asked the head of volunteers for Marstella’s address, which her mother evidently provided. Kotaku reached out to Sony about Marstella’s injury and care package, but they did not respond in time for publication. On the day that the package arrived, Marstella said that she got a text from UPS alerting her to it, but was confused because she hadn’t ordered anything. She opened it nonetheless—”who doesn’t love getting packages?” she said. The first thing she saw as a brand new PS4. Marstella said over the phone that having grown up with older brothers, she’d played games on their Xboxes before, but had never had her own console. Getting a PlayStation 4 is allowing her to develop her own interest in gaming. As of now, Marstella is full of nothing but thanks for the person who hit her with a golf ball. “I cannot put in words how appreciative I am of the guy that hit me,” she said. Though he sent a card, he only signed his first name, so Marstella doesn’t know the identity of her benefactor. “He was under no obligation to do any of this and I am overwhelmed with gratitude,” Marstella said. May all of us be so lucky when struck by a falling object.